It just keeps getting better and better! What am I talking about? The snow pack in the Sierras? Well, no, but that's true too! 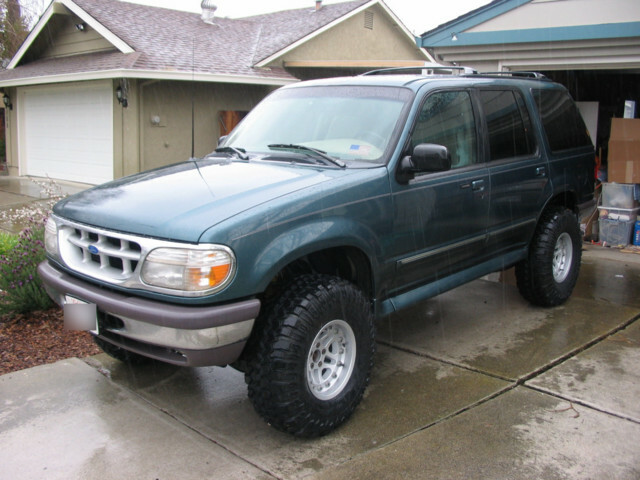 What I'm talking about is the continuing buildup of a “grocery getter” 1997 Explorer into a competent trail rig, something that you'd be pleased to take out hunting, fishing and camping, something that 99 out of 100 Explorer's have never done. It's not about extreme tech, it's about applying the basics to a good truck and making it better. As you may have followed, the first thing we did was get the SUV lifted in order to keep it from scraping on the simple stuff. We installed a 4” Superlift suspension kit on it, as a start. After getting it lifted, we had to do something about traction. The logical step was the addition of a Richmond Powertrax Locker to keep it hooking, and covering that with a cool yet functional Blue Torch Fabworks Diff Cover to protect it, as this Explorer, while lifted, still sits on “normal” tires. I chose to leave the rear sway bar on temporarily, until after the “Next Step”. What is that next step? Better tires and wheels. I was running 31” tires, and with the 4” lift I could now go taller. 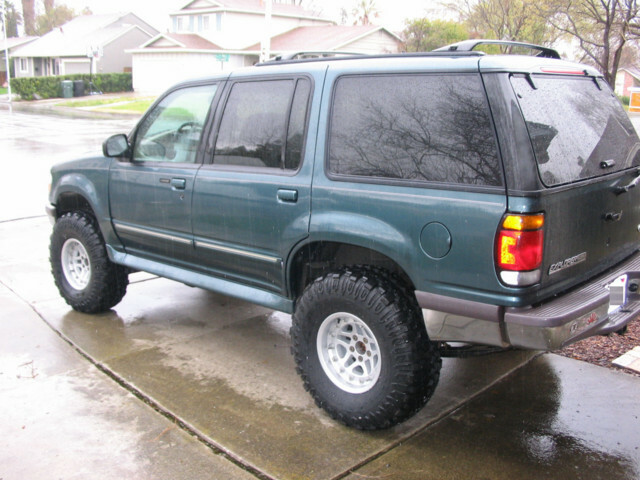 The Explorer fanatics on various sites agreed that with a 4” lift, 33's on 15x8 with 3.75 backspacing was the way to go. I really wanted to go with something that would save me. My philosophy with this vehicle is that it's never going to be radical, it has to get me offroad, and get me BACK. I was researching tires and wheels, when I found the http://www.rockmonsterwheels.com/ by Hutchinson. These wheels are one of the few street legal beadlocks available. That means you can use them on a daily driver, and not worry about the law OR killing someone if a ring decides to fly off. This is also perfect for me, as I can air down to moderate levels and go off road, but if I get stuck way back, I have some “insurance”: I can air down extreme, back out of the problem, and save myself. 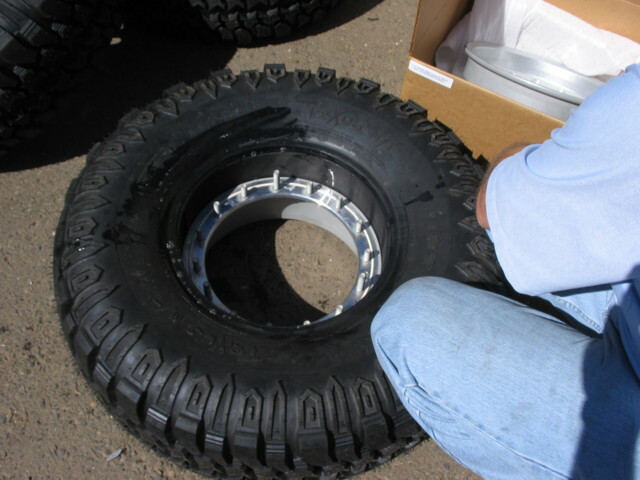 The first application that Hutchinson created for the Rock Monster Wheel series was for the Jeep Wrangler, in guess what size? 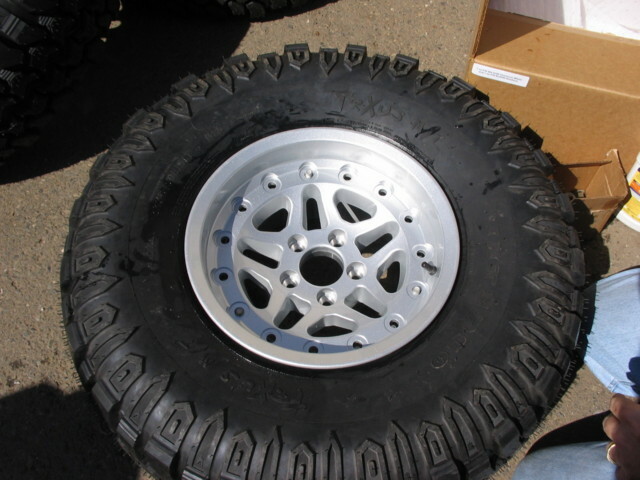 15X8, 5-on-4.5” lug pattern (same as the Explorer's), with a 3.65” backspacing, basically perfect! I contacted Hutchinson, and they weren't sure about the fitment, as it wasn't designed for the Explorer at all. The danger of buying Wrangler wheels for the Explorer is that the stock hub opening on a Jeep Wrangler wheel is too small for the Explorer. We took some measurements, and it looked close, but good, so we went for it. Camo had nothing but good things to say about his big Interco TrxUS MT's in the snow, and that's one of the reasons I wanted better tires, all the better to head up to Tahoe with! Once we got the tires and the wheels together, it was time to install. 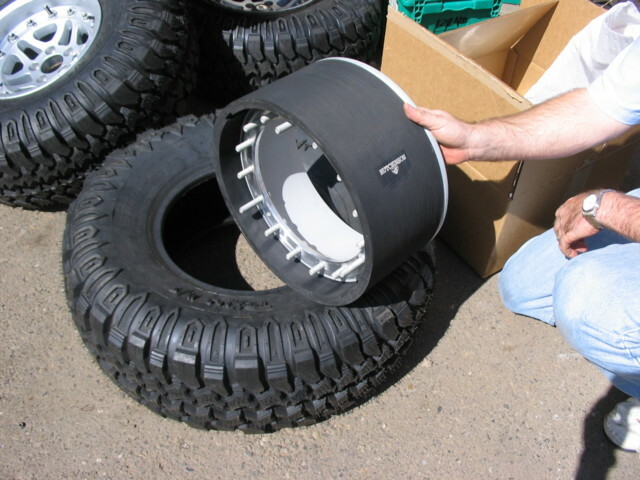 The Rock Monster wheels are a “self install”, and you can download a PDF and a video from their website that makes it look easy. Well, I'm happy to report that it IS easy if you know a few tricks, and we're here to help you understand those tricks. I did two of these installations along with Josh at High Impact in front of a crowd of onlookers at a swap meet at http://www.davezoffroadperformance.com/ in Diamond Springs. If a computer nerd who spends way too much time banging on keyboards can do this, so can you! Above you can see the construction of the wheels. They are 2 piece modular, with an inner half that forms a cylinder that the rubber beadlock can rest against. The outer half is the face of the wheel that you see, mounted on 15 studs that are fitted to the rear half. The design makes sure that the beadlock is supported by the wheel itself, it won't deform/fold inwards and allow the bead to slip. Hutchinson is a military supplier first, and an aftermarket supplier second. They make their products to better tolerances than one might expect. The beadlocks ships on the rear half, and you must first take it apart. It takes a few minutes of slowly tugging and pulling and going around the edge of the rubber bead lock in order to slip it off the wheel, that's how close they fit these products, and as I'll explain later, that will save you a lot of hassle down the road. You can see how the bead lock wraps around the wheel, pinching the tire bead against the wheel rims. It locks both the beads, unlike traditional bolt-on bead locks. First, download their instructions, and check them out. Follow them, my pointers are in addition to the official docs, not a replacement! 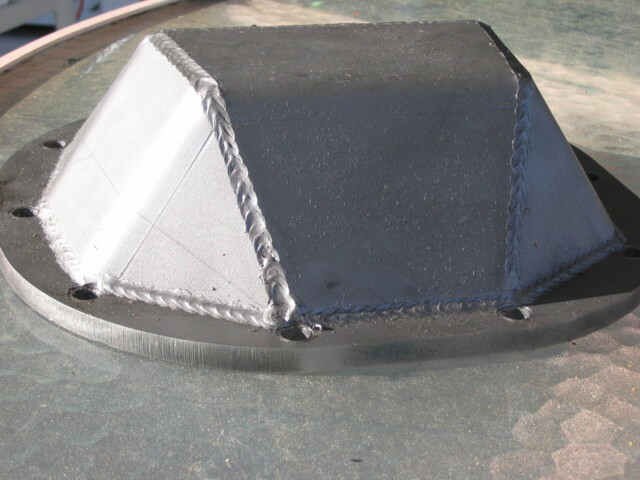 The first thing you want to do is put your tire down on a work surface with the outside edge facing DOWN. 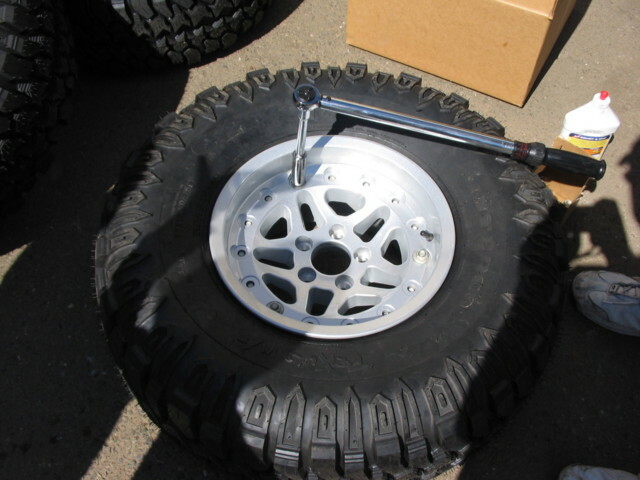 Take the bead lock and insert it into your tire, getting it lined up around your tire beads as best you can. In preparation for dropping in the back half of the wheel, lubricate your tire bead surfaces and the body of the wheel, avoiding the mating surface that holds the O-ring (more on that later). The best thing to use is a proper tire soap. As a "field expedient", I used Murphy's Oil Soap, which is a vegetable soap used for cleaning floors, and comes in a pre-diluted form. Don't do as I do, do as I say, and use the real stuff, not Murphy's! (Note: Murphy's works well because it's a vegetable soap, not a detergent. 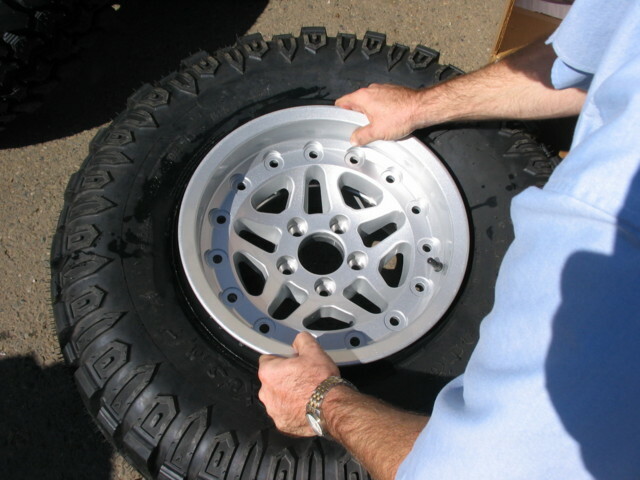 The pre-diluted form gives just enough lubrication to do the job, and won't let the tire slip on the rim at a later date. Don't use dishwashing soap!). 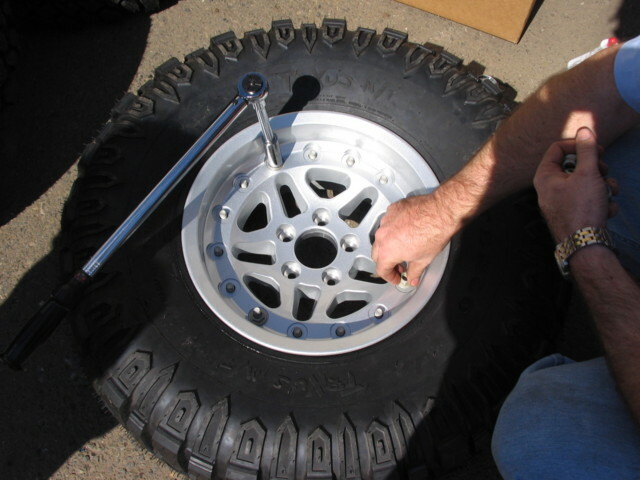 Drop the back half of the wheel into the tire/lock combination, making sure to line up the small hole in the back side of the rim with one of the two air channels in the lock. This will ensure that as you put everything together, all parts are properly aligned. 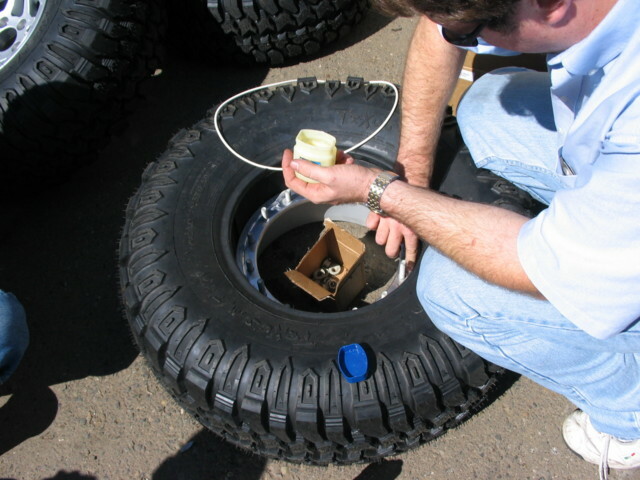 It will take a couple of minutes of wriggling to get the wheel-half down into the tire/beadlock the first time, but once you have the technique down, it will go quickly on the remaining wheels. Next, turn over your tire, it will now be resting with the back side of the tire and wheel on the ground. Wipe down the mating surface and O-ring channel with a dry, clean rag, and use denatured alcohol to clean it if necessary. Then carefully lay in one O-ring into the channel. Hutchinson recommends using some petroleum jelly to keep it in place, but don't think that it's used for sealant, as the the tolerances on this wheel are great and you don't require an additional sealant. In my case, I pushed in a little petroleum jelly into the O-ring channel in several places around the radius of the channel, and I gently coated the entire O-ring with petroleum jelly as well. Don't stretch out your O-ring, you'll end up with a poorly sealed wheel. Note that Hutchinson gives you 2 o-rings with every wheel, which is a great way of doing business. 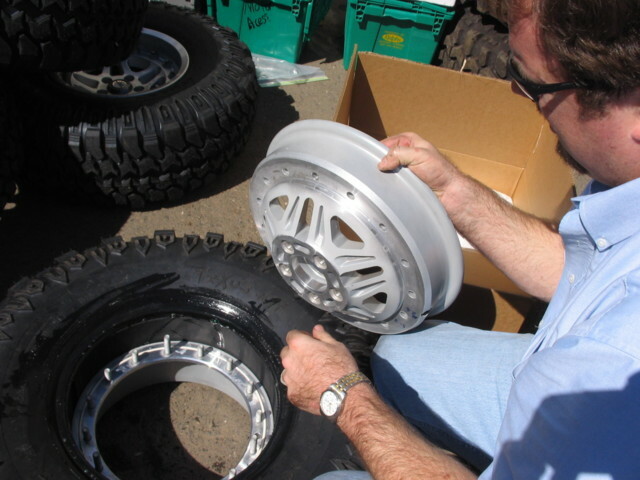 Next, with adequate tire soap on the wheel-half and on the tire beads, drop the front wheel-half into the tire. Align the valve stem with the hole in the back rim. You've just completed the most technically challenging portion of the install! Now comes the tedious portion, tightening it all together. Hutchinson ships with 3 studs that are longer, and 12 shorter studs. You use the 3 long studs to pull the rim halves down to where you can install the remaining 12. Take a close look at the following pictures as I tightened them down, in a star pattern (click on the pictures and take a close look at the amount of stud showing above the rim face). Finally, torque them all down in a star pattern to 60lbs, making sure that you do so evenly as you don't want the o-ring to push up and out of the channel. After getting them all to 60lbs, go once around at 80lbs for a final torque spec. Once we got them aired up, Josh from High-Impact went to balance them, and one of them wouldn't balance, we had a visible run-out issue with it. We did put them on the truck for a quick drive around, but tire rub issues (corrected later with a Dremel, at the expense of some plastic body cladding) and the tire that wouldn't balance (or hold air!) cut that experiment short. We were running out of time, so loaded them up and went home, where I took the tire apart and found the culprit, a pinched o-ring. This probably happened on my first wheel, as I moved it between the ground and my bench at home before the wheel halves were snugged down on each other. Once I fixed that, not only did it balance well, but it held air great. First of all, I have to take my hat off to the visitors and customers at the DavezOffroad swap meet. These guys know their stuff, and were asking the best questions. Sometimes when you show a blingy new product like the Rock Monster Wheel to the public, you end up with a bunch of "know-it-alls" who put down the product. The crowd up at Diamond Springs wasn't like that at all, they had great questions. The most common question, other than "can I get it in size X? ", was about the 3 long assembly studs. Guys who hit the rocks were concerned that the longer studs could be damaged or bent, and asked if they could be removed and replaced with shorter studs. Hal Roth at Hutchinson responded to this concern: "My preference would be to furnish ALL short studs, and provide assembly holes for temporary threaded rod during installation. That's our standard for most non-civilian applications. As alternate, studs can be removed and replaced in the field, but must be done with a press." In other words, there is no option today, but they have taken this feedback and will consider it for the future. They do care about your feedback, that's a sign of a great vendor. They also read the Pirate4x4.com forums quite regularly. They may not post, but they ARE listening, keeping their fingers on the pulse of the market. 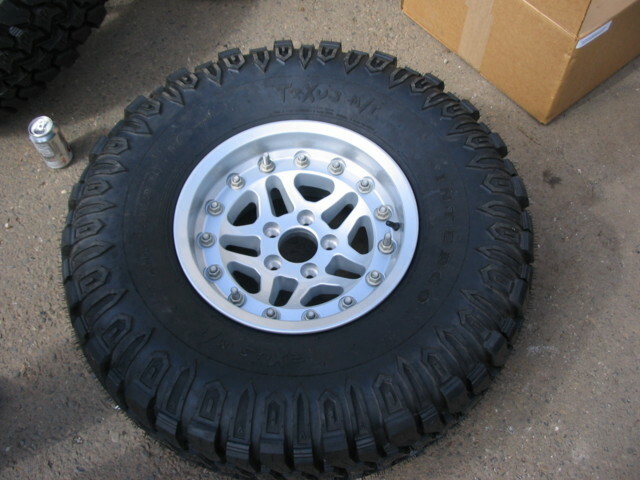 The Interco TrxUS MT tires on this combination are a fantastic off-road tire. My only problem is that I've been waiting for it to dry up a little before I take this too far off the beaten path! We've had 7 weeks of rain in Northern California, and little opportunity to do anything other than play in the mud. I can attest that these tires absolutely hook up in the mud, and I've heard that they work great in the snow as well, which I'll test out in a few weeks. What really amazes me about the TrxUS MT is it's on-street qualities. It's a very soft sidewall tire, so my ride actually improved over my old all-terrain tires. In addition, the tread pattern is amazingly quiet for a mud terrain tire. On wet road surfaces, they stick very well, possibly due to the siping, and hydroplaning is almost nonexistent given the big open tread. I highly recommend these for the driver who wants superior off-road capabilities while requiring that they be livable on the street. The Hutchinson Rock Monster wheels are amazing as well. I was told by Camo "I've never seen any two-piece or bead locker not leak, they all leak. I suggest you use a lot of silicone, otherwise you're going to be filling them up every other day". Well, I'm happy to say that Hutchinson has proven Camo wrong! 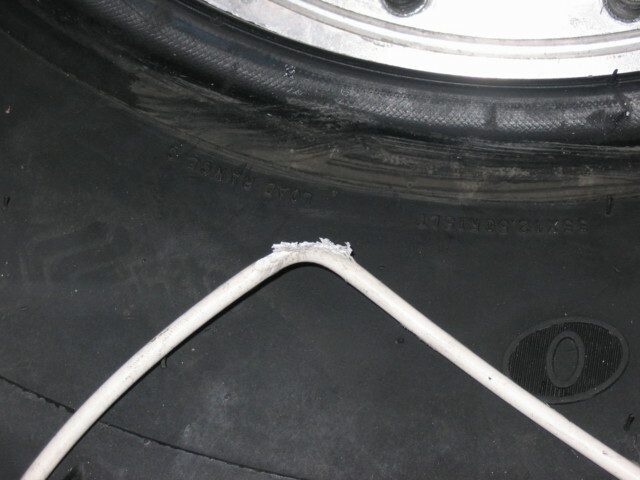 In over a month I have lost zero air, not even a full pound, on any one tire. The tires and wheels have been holding air better than the stock tires and rims on my Mustang! The tight tolerances of the well manufactured wheel make this possible. Specific to the Second Generation Explorer, the 33's will fit with minor trimming. The combination of the taller tire, the existing 4" lift, and the wider stance are amazing, they really transform the vehicle. I haven't had the chance to air-down at an OHV park with these yet, I'll update the review when I've had the chance. I've received word that at Moab EJS last week, a Rock Monster Wheel customer running the Kane Creek trail aired his Goodyear MT/R's down to about 6lbs to get through some ledge obstacles, without losing the bead. I haven't verified it, but it's completely believable. This system WORKS. A final word of thanks to Hutchinson for giving us some last-minute suggestions on installation techniques, Interco for shipping tires in time for the swap meet, and to Josh at High Impact for mounting the tires. If you are interested in these wheels, which are now available in other popular fitments, be sure to call Josh at High Impact, he's a friend of the board, as well as one of the few dealers in the USA to carry Hutchinson wheels.